Kia Ora, Talofa lava my name is Tausilia Mcclutchie. I am of Samoan and Māori decent and I am from the beautiful Te Tairawhiti, Gisborne. 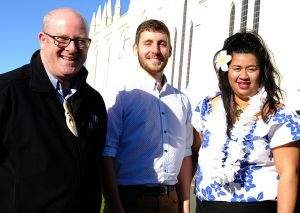 My role at the Palmerston North Diocese is part of the youth team as the St Peter’s College Chaplain in Palmerston North, the Whanganui Parish Youth Minister, and Cullinane College Chaplain. Another role I have is living and assisting with the running of the Young Adult Community house in Palmerston North called Te Ahi Kaa. Youth Ministry was not something I ever imagined I would pursue. It kind of evolved from me being a member of the Young Adults’ group to where it is today. My main mission has been simple from the start – to bring youth closer to Christ and give them the tools they need to strengthen their relationship with God through the Sacraments. I was lucky enough to experience this as a teen, which built a sense of resilience within me and the idea that God has always had my back. This is an experience I’d like to pass on to our youth and teens. Relational ministry, getting to know the youth, being authentic and building strong, trusting relationships with them, have been my key components in being able to achieve this. I believe God works in mysterious ways and has led me to my ministry today so I am able to be God’s instrument to help and support our youth. The youth who are lost, broken and confused but also to triumph with our youth who have been saved, loved and gladdened. As a result, this humbling opportunity to serve the youth of today has been both challenging and rewarding, overall has been a true blessing. Year 12 students are currently linking the mission of the Catholic Church with helping communities in need on a global level. It is also part of the Church’s mission to help others within our own community. 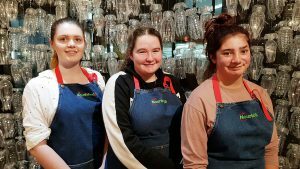 That is why Alexandria Scurr, Jasmyn Hannan and Alyssa Malone, students at Sacred Heart College, Napier, immediately responded to the call of help for the fundraiser of ‘the Rescued Plate’ in support of Nourished for Nil’s food rescue project. Nourished for Nil have already saved 150 tonnes of food from going to landfill this year. Their food-rescue project gifts free food to people in the community and saves waste. They are serving up to 300 people at any one time of being open for only an hour a day. This volunteer organisation works in solidarity to serve the community. The students of Sacred Heart College are grateful for the opportunities to have experienced the joy of giving with Nourished for Nil and are in full support of this initiative. Natalie McPherson, Teacher of Religious Studies, Sacred Heart College, Napier.